Achieves better than -110dBm of FSK sensitivity. MAXIM Integrated Products, represented in Australia by Arrow Electronics , has released the MAX7042 VHF/UHF PLL-based FSK receiver. It is housed in a 5mm x 5mm, 32-pin thin QFN package and is suitable for low-cost, high-volume applications where range is critical. Typical applications are car-alarm key fobs, RF modules, security products, remote controls, and remote sensors operating at 308MHz, 315MHz, 418MHz and 433.92MHz. The MAX7042 achieves better than -110dBm of FSK sensitivity. It removes the need for an external LNA superfluous, reducing overall system cost. The MAX7042 also includes an on-chip, 44dB (typ) image rejection mixer which eliminates the need for SAW filters in many applications. The part operates off 3.3V or 5V supplies and down to 2.4V. All the active components required in a superheterodyne receiver are included in the MAX7042: a low-noise amplifier (LNA), an image rejection (IR) mixer, an integrated phase-locked-loop (PLL), a local oscillator (LO), a 10.7MHz IF limiting amplifier with receive-signal-strength indicator (RSSI), a low-noise FM demodulator, and a 3V regulator. A differential peak detecting data demodulator is also included for analogue baseband, data recovery circuitry. 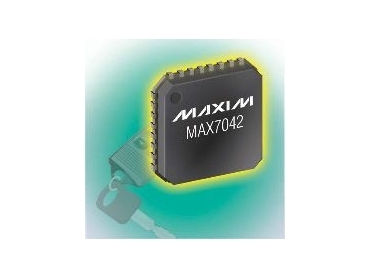 The MAX7042 draws approximately 20nA in shutdown mode and only 6.4mA in receive mode. Depending on the components selected, it can receive up to 66kbps data rates (NRZ) and transitions from shutdown to valid data out in less than 250μs. In power-cycled applications, this quick transition minimises the time that the system needs to be in receive mode. The MAX7042 operates over the automotive temperature range from -40°C to 125°C.